85,000 people in the United States are employed by 520 Irish companies through Foreign Direct Investment. Enterprise Ireland announced that in 2018, there was more than 520 Enterprise Ireland supported companies operating in the United States directly employing more than 85,000 and supporting 954 locations, across all 50 States. Ireland is now the ninth largest source of foreign direct investment into the United States at $146.2 billion. Additionally, in 2018, Enterprise Ireland-supported companies opened 60 new operations in the U.S.
On March 13th, An Taoiseach (Irish Prime Minister) Leo Varadkar, will host a business development roundtable with leading Irish companies with plans to further invest in the U.S. The roundtable participants will discuss opportunities for Irish companies to continue to expand their U.S. operations, and how the Irish government can support additional investment and growth. In addition to Wednesday’s events in Washington, D.C., and in one of the largest Enterprise Ireland economic missions, more than 110 Enterprise Ireland supported companies are participating in commercial events and meetings across the U.S. during the week of St. Patrick’s Day with the goal of advancing partnerships and driving new business. Irish workers were ranked the most productive in the world by the Organisation for Economic Co-operation and Development (OECD). For every hour that an Irish person works, they add $99.50 (€88) to the GDP of the economy, according to the latest OECD findings. Following Ireland is Norway, at $83.10 (€73.55) per hour, with Germany ranked third at $72.20 (€63.90) per hour. Ireland’s rate is almost twice the OECD average of $54.80 (€48.50). Ireland also ranks as more productive than some of the world’s largest economies, including the UK ($61.10, €54.08), the US ($72, €63.73) and France ($69.60, €61.60). According to the OECD, labour productivity is a key driver of economic growth and living standards. GDP per hour worked is a measure of labour productivity and examines how efficiently labour input are combined with other factors of production and used in the production process. According to the OECD, productivity remains below pre-crisis rates in many countries, while economies such as the UK, Canada and the US have been slowing down since the early 2000s. Overall, productivity growth in manufacturing continues to outpace that of services. Within the business services sectors, information and communication services are driving growth in Ireland. The OECD found that, in most countries, there are productivity gaps between smaller and larger companies. Countries such as Ireland, with a high concentration of large multinational firms, benefit from increased productivity. Investment in knowledge-based capital (KBC) is also important. People trained in, and working for, knowledge-based industries help to foster economic growth and productivity. With an influx in tech companies over the last decade, Ireland has seen huge growth in knowledge-based industries. The OECD findings show that Ireland is bucking the trend of sluggish productivity growth that has affected most advanced countries since the mid-1990s. Most western economies suffer from a ‘productivity paradox’, in which, despite rapid technological change, increased use of global value chains and rising education levels, they perform poorly from a productivity growth perspective. Since the 1990s, Ireland has more than doubled its labour productivity, while countries such as the UK, Germany and France have failed to reverse declining levels. Ireland is positioned ahead of European average, with Small and Medium Enterprises and positive employment trends recognised by the EU. Ireland moved up to ninth place in the European Innovation Scoreboard 2018, a ranking of Europe’s most innovative countries, published by the European Commission. The European Innovation Scoreboard ranks all 28 EU member states and a select number of non-members based on research and innovation performance. Introduced in 2010, this year’s scoreboard reports that Ireland’s innovation performance has improved 8.5% since 2010, ahead of the overall European average of 5.8%. The European Commission ranks countries under four categories: innovation leaders, strong innovators, moderate innovators, and modest innovators. In ninth place, Ireland is positioned in the strong innovators group. The scoreboard recognised Ireland for innovative SMEs; employment impacts, particularly increased employment in knowledge-intensive areas and fast-growing companies; and sales impacts, or the economic impact of high-tech and innovative activities and exports. Sweden led the 2018 rankings as an innovation leader. Earlier this year, Ireland moved up three places to rank 13th in the Bloomberg Innovation Index 2018, a list of the world’s most innovative countries. The rankings confirm Ireland’s growing reputation for innovation, a key source of competitive advantage for companies established in the country. In November 2017, Ireland was named first for skills and innovation in the EU Commission’s 2017 Fact Sheet. Enterprise Ireland, the national export agency, has 14 Technology Centres, 15 Technology Gateways and 12 Science Foundation Research Centres, which focus on cutting-edge areas including big data, pharmaceuticals, medical devices, digital content, nanotechnology, sustainable food, smart technologies and marine renewable energy. In each of these centres, scientists and engineers work in partnership with academia and industry to pursue crucial research questions with commercial potential. The Irish Government supports these activities, as it builds on two decades of investment in science and technology with the implementation of its Innovation 2020 strategy. Irish researchers have secured more funding from Horizon 2020, the EU’s programme on research and innovation, which commands a total budget of approximately €75 billion. Ireland has secured over €513 million since the programme was launched in 2014. In the most recent batch of announcements, Ireland secured wins under both the academic and industry focuses of the research programme. Three awards totalling more than €8 million were made to researchers at Irish universities by the European Research Council earlier this month. Professor Fergal O’Brien at the RCSI (Royal College of Surgeons in Ireland) Department of Anatomy and AMBER: The materials science research centre, funded by Science Foundation Ireland, was awarded €3 million for a research project that aims to revolutionise the treatment of damaged articular joints, such as the knee and ankle. This innovative treatment is achieved by combining cutting-edge advances in the area of 3D printing and advanced manufacturing with new insights in stem cell and gene therapy to develop a platform biomaterial technology, or scaffold, capable of repairing bone and cartilage. Professor Rhodri Cusack at Trinity College Dublin (TCD): The professor and his team at the Trinity College Institute of Neuroscience (TCIN) were awarded €3 million to conduct a research project which will use neuroimaging to measure the hidden changes in mental representations during infancy and compare them to predictions from deep neural networks. The technology has been responsible for recent exciting advances in artificial intelligence. Professor Kenneth Wolfe, of the University College Dublin (UCD) School of Medicine and Conway Institute: Professor Wolfe was awarded €2.37 million for his project ‘Killer plasmids as drivers of genetic code changes during yeast evolution’, which will examine the evolution of genetic code and the changes it underwent in several species of yeast. Earlier this month, nine Irish Small and Medium Enterprises were awarded Phase One funding under the SME Instrument, the programme’s industry focus. The award provides a sum of €50,000 to fund a feasibility study and business acceleration services. Irish biotech company Avectas, which is supported by Enterprise Ireland, was awarded €2.1 million under Phase 2 of the SME Instrument, Avectas is developing a technology allowing for permeable cells to be extracted from a patient, re-engineered to attack cancers, and infused back into the patient. They join 56 other Irish companies who have been awarded phase one funding since 2014. Ireland’s strong performance reflects its growing international reputation for innovation, a key source of its competitive advantage. Enterprise Ireland’s 14 Technology Centres, 15 Technology Gateways and 12 Science Foundation Research Centres focus on cutting-edge areas including big data, pharmaceuticals, medical devices, digital content, nanotechnology, sustainable food, smart technologies and marine renewable energy. In each of these centres, scientists and engineers work in partnership across academia and industry to address crucial research questions. Building on two decades of investment in science and technology, the Irish Government continues to put innovation first with the implementation of its Innovation 2020 strategy. Ireland is home to some of the most remarkable medtech start-ups in the world. Let’s take a look at a small selection. Having enjoyed exponential growth from 50 to 350 companies over the past two decades, Ireland has quickly emerged as one of the world’s top five medical technology hubs. While 13 of the top 15 global medtech companies have bases in Ireland, it is not only big companies who are enjoying success. The country has also spawned an incredible wave of homegrown talent, and now boasts some of the most innovative medtech start-ups in the world. Coroflo has developed a groundbreaking breastfeeding monitor, the Coro, which can accurately measure exactly how much breast milk a baby is consuming. The Coro is the first breastfeeding monitor in the world that can give mothers accurate, precise, and real-time data about milk supply. Coroflo has already received Richard Branson’s seal of approval and raised €900,000 in seed funding at a €4m valuation. “One of the main obstacles to successful breastfeeding is a concern about low supply, with some mothers uncertain about how much milk their baby is getting,” explains CEO, Rosanne Longmore. The platform developed by Carefolk is for people who care, quite literally. Designed for both healthcare professionals and carers, the platform provides access to six products that can be used independently or together on the platform, integrating and talking to one another to create one perfectly formed system. A huge undertaking, the project is certainly having an impact. Carefolk won two awards at the 2017 IMSTA Medtech Awards, picking up the Best eHealth/Digital and Best Primary Care/Community awards. While you might not have heard the term rhinitis, if you have not suffered from the condition yourself, you almost certainly know someone who has. The term describes an inflammatory condition on the inside of the nose that results in congestion or rhinorrhoea, and affects roughly one in five people across the world. Based in Galway, on Ireland’s west coast, Neurent Medical is developing a minimally invasive solution for the condition, which has the potential to revolutionise the way in which patients are treated, offering a better quality of life for millions of people. “It’s a disruptive device play in a pharma world,” says co-founder and CEO Brian Shields, who established Neurent Medical with David Townley in 2015. Founded by Rob Laffan, father of a five-year-old girl with non-verbal autism, TippyTalk helps other non-verbal children to communicate. The technology translates pictures into text messages, which are sent to the phone of a family member or caregiver. The app helps a person who is non-verbal to communicate and express a desire, want, need or feeling. The innovation isn’t limited to the home. The company has just launched a version of the product for the educational and professional care markets called TippyTalk EDU, which boasts two-way communication and a hub that provides data-driven insights on students and clients. Incereb is developing a range of paediatric, neonatal and foetal sensors for EEG monitoring that can be applied in minutes, with minimal training. 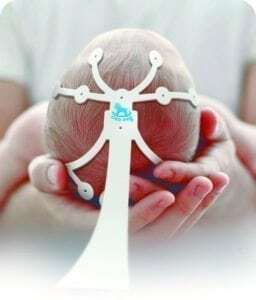 Previously, attaching EEGs to a baby’s head to determine brain function would take time and training, and would be uncomfortable for the child. Incereb set out to change that. “Having worked in neurophysiology for almost 20 years, with almost 8 years in paediatrics and neonatal ICU, it was obvious that many NICU devices were simply adult devices scaled down for use on tiny babies,” says founder Jim Roche. The Incereb design has already celebrated a number of successes in the US and entered the South American market last year. Following an extensive peer review, Incereb’s neon range (neonatal EEG Electrode arrays) received a 2017 Innovative Technology designation from Vizient, the largest member-driven healthcare performance improvement company in the US, which represents approximately $100 billion in annual purchasing volume. Managing medication can be tricky, even for those who only need to take one tablet per day. When self-injection and dynamic schedules are involved, managing medication can be a huge barrier to successful treatment. With a 96% patient acceptance rate, HealthBeacon – described as a ‘sharps bin’ for those who self-inject at home – is the result of some tinkering and a lot of effort, according to founder Jim Joyce. “After going a few rounds as mad scientists, we found a practical solution that helped patients take their medications on schedule,” he explains. Connexicon Medical specialises in the manufacture of tissue adhesives and sealants for topical and internal applications. Its product, Indermil Flexifuze, is a liquid topical tissue adhesive used to close wounds that can stay in place for five to eight days, acting as a physical barrier to microbial penetration. Part of a fast-moving and competitive market, the company has raised over €1.15m in funding to date. A more established start-up, having been around for five years, Vivasure makes polymer implants and delivery systems – primarily focused on minimally invasive vessel closure in cardiology, interventional radiology, and vascular surgery. In 2016, its first European product – a vascular closure device – saw investors back it to the value of over €16 million. The company aims to meet clinical requirements with a particular focus on arterial and venous closure devices, based on its patented PerQseal technology. Sign up to our newsletter to keep up with the latest medtech news from Ireland. Ireland has moved up three places in the Bloomberg Innovation Index 2018, a list of the world’s most innovative countries. 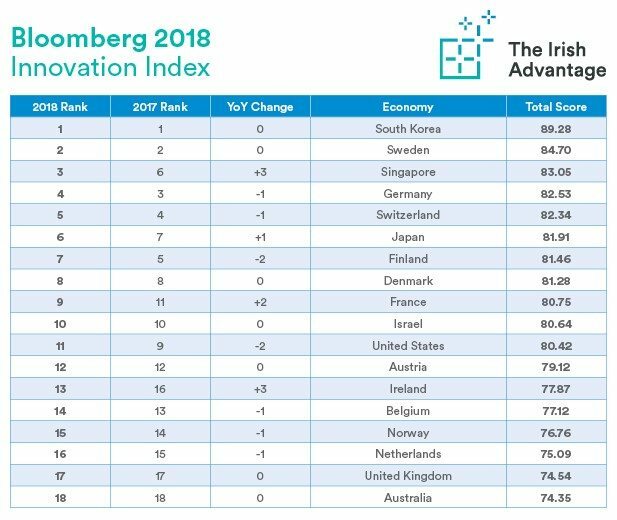 Ireland ranked in 13th place overall, with more than 200 economies considered in the Bloomberg Innovation Index 2018 ranking process. Ireland ranked in first place in subcategories including value-added manufacturing and productivity. The Bloomberg Innovation Index 2018 also showed a strong performance for European countries, with France and Germany featuring in the top ten. The UK remained in 17th place. South Korea and Sweden retained their top two rankings, with Singapore in third position. The US fell out of the top 10 for the first time in the six years the Index has been published. Economies were scored on a 0-100 scale based on seven equally weighted categories, including research and development spending and the concentration of high-tech public companies. The ranking reflects Ireland’s growing reputation for innovation, a key source of competitive advantage for companies established in the country. In November 2017, Ireland was named first for skills and innovation in the EU Commission’s 2017 Fact Sheet. International customers and partners of Irish companies leverage innovation to increase efficiency and productivity and enhance their product portfolios.